Sinai Jeep Safari Adventure Excursions and Safari Trip to Abu Galoum Right Between Dahab & Nuweiba. Ride Camel by Aqaba Gulf Then Enjoy Snorkeling in Blue Hole, Enjoy the Bedouin Life Style, Lunch and tents, Dahab Shopping. Tour From Sharm Hotels. 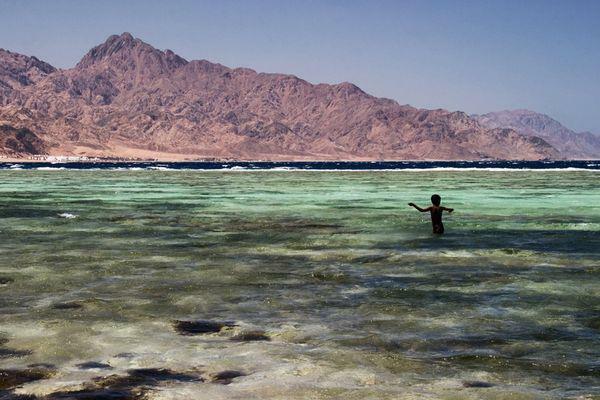 Snorkel the Blue Hole, ride a camel and go bargain shopping in Dahab on our day trip from Sharm el Sheikh. If your time in Egypt is limited, this is the day tour you are looking for! Pick up from your hotel and Take the off road trail and experience frost hand the best of what Sinai has to offer. This may not be the most comfortable way to see the sights on offer but it's certainly the most fun. Experienced drivers in air-conditioned jeeps will take you on an exhilarating of road excursion to see the Bedouins and their villages, compare four wheels with four legs as you travel like a local on an unforgettable camel ride. Snorkeling at the famous blue hole completes the activates for the day, then time to chill out in Dahab with lunch at local restaurant. And then back to your hotel.